← (#130) Making Your Life Work! realize your dreams one step at a time. The point is whatever our goals maybe we have to take action one step at a time. I am proponent of establishing huge outrageous goals. We need to stretch ourselves. Otherwise we stand the chance of settling or short-changing ourselves with less than we are capable of attaining. But we have to go about it in a smart way. 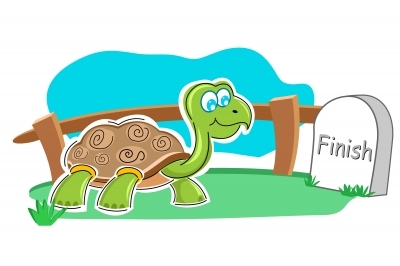 At the very least, start slow and remain steady. So how do you lose 50 pounds? One pound (one ounce) at a time. How do you build an exercise routine? Ten minutes at a time might be a good jumping off point. How do you get out of debt? One payment at a time. How about that book? One page at a time. Small victories can provide huge psychological advantages. We then engage in a little arithmetic. Here is how I set it up with my students. The student responses this week ranged from 65 cents to “about $3,000.” I then placed the following table on the screen. I have added a twist that I believe delivers the real lesson. 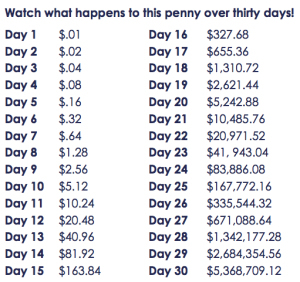 Yes, one penny can bring about great results, but we could become quickly overwhelmed and defeated if we look at the $5 million dollar figure and conclude, “There is no way I can have that much money in 30 days. Why even bother starting?” Just like the person who says, “There is no way I can lose fifty pounds in thirty days” and gives up on his diet. But think of what you can do if you break that larger goal down to manageable targets. So, using the table above, I ask the students, to look at day seven on the table. “How many of you think you could find an extra 64 cents at the end of a week?” Every hand goes up. “OK,” I continue, “Look at day number 10. How many of you think you could find an extra $5.12 in a week and a half?” Again, hands shoot up. The challenge I give them is to find a day on that table that they believe is doable. Set that as a goal. “By the time next Wednesday arrives I will have $5.12 in my penny plate. This will be extra money. This will be money with which I will start my wealth building program.” Then once they get to the $5.12 I tell them to begin again for another 10 days and another $5.12. Whether it’s wealth-building or a weight-loss program or writing your first book, or completing a college degree have a plan, take specific steady action each day, and remember that you will realize your dreams one step at a time. This entry was posted in financial literacy, Goals and tagged action, dreams, financial literacy, goals, wealth, wealth building. Bookmark the permalink. Thank you very much for your card and thoughtful message inside. I was touched by your thoughtfulness. Needless to say, I look forward to your weekly messages. I use them as meditations and pass the message onto many students and staff. Unfortunately, I am unable to view the video at the bottom on my iPhone? Be well and stay strong over the next few weeks. ***************************************** Sent from Ski’s iPhone. Please forgive brevity, abbreviations and possible errors for the keys are much smaller than my fingers and I am trying to respond to you in a timely manner. Thank you! Thank YOU, Ski. I am glad the blogs prove meaningful for you. Thanks for sharing them. Here is the link to the video…not sure why it would not play: http://www.youtube.com/watch?v=_u33kFTYT8w&list=PLHs9tcF6fT3SBGbNWdM_JTtM5s13BATd-&index=1&feature=plpp_video. If it does not work on the iPhone, there is always the PC. 🙂 Enjoy the week. Hello, i think that i saw you visited my website thus i came to return the favor. I am trying to find things to improve my site!I suppose its ok to use some of your ideas! a catchier post title? I mean, I don’t wish to tell you how to run your blog, however suppose you added a post title that makes people desire more? I mean (#131) One Penny at a Time | Steve Piscitelli’s Blog is kinda vanilla.